May 14. 8.30PM – 10.30PM. Nuit des Musées (Museum Night). Visitors can come and leave anytime as they wish. The admission is free. Aki Onda is an electronic musician, composer, and visual artist. Onda was born in Japan and currently resides in New York. He is particularly known for his Cassette Memories project – works compiled from a “sound diary” of field-recordings collected by Onda over a span of two decades. Onda’s musical instrument of choice is the cassette Walkman. Not only does he capture field recordings with the Walkman, he also physically manipulates multiple Walkmans with electronics in his performances. 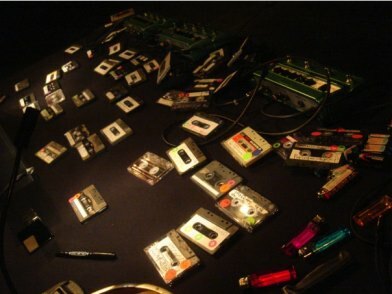 Cassette Memories is a music performance, or a ritual, that Onda conjures up the general essence of memory by playing his field recordings, so to speak his personal memories, at a location which has its own memories. It’s invisible, but you would feel that live memories awake sleeping memories. Birdcage is a sonic gallery initiated by Daniele Balit as an itinerant and temporary display to host artistic initiatives. Previous appearances include : Stockholm with Carl Michael von Hausswolff, Amsterdam with dj sniff, and Beijing with Yan Jun. Birdcage gracefully acknowledges support for the production of this project from the Dena Foundation for Contemporary Art. And the kind collaboration of the Louvre Museum. A special thanks goes to the Louvre Contemporary Art Program, chief curator Marie-Laure Bernadac and Pauline Guelaud. And to : Eric Cordier, Licia Demuro, Silvia Ferro, Satoko Fujimoto, Mathias Geoffroy, Daniel Hosner, Hannah Huesberg, Li Ting Hung, Marie Lelouche, Sandrine Marc, Anthony Morabito. Eric Perier, Céline Prunneaux, Vincent Voillat.